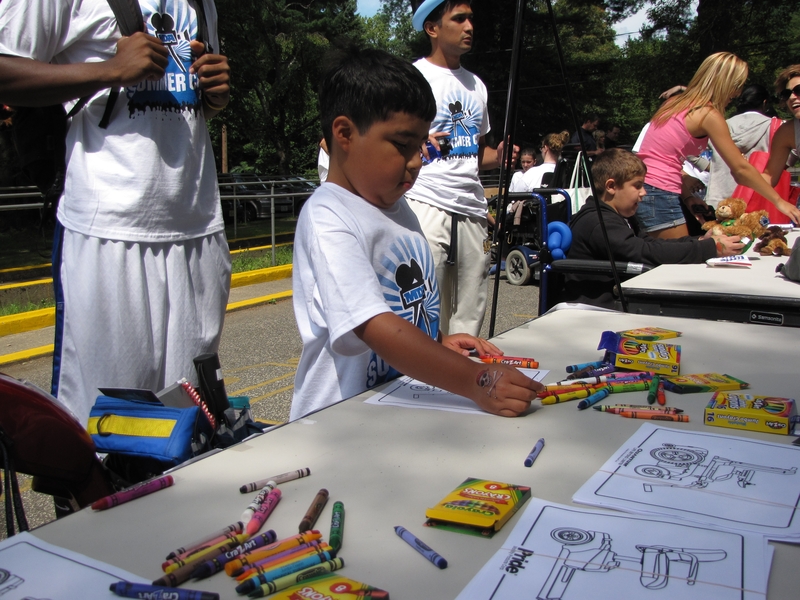 I had the absolute privilege of visiting a summer camp for children and teens with various forms of muscular dystrophy. It was among the most fun I’ve had, as the campers were so awesome, such spirited personalities, as children are. However, as much fun as MDA camp is for everyone involved, there’s still a looming reality: Most of the campers will pass away by their mid twenties. There’s truly an injustice to it all, one that, for me, is impossible to explain – that is, the universal “unfairness” that within 10 years or so, many of the campers whom I met will no longer be with us, that not only will their lives have been lost, but with them, we all will have been robbed of their amazing life-long potentials. I mean, their time on this Earth is impacting – I know, they profoundly impacted me – but to think of what these amazing individuals could accomplish over sixty or seventy years – not just twenty – is limitless. Yet, we’ll never have the chance to know because of the inexplicable injustice of a life-robbing disease. I remember leaving the camp thinking, Cash my chips in now, God, and give my lifespan to anyone of those kids – I’ve had my shot at life, and I’d gladly pass my years left on to any one of those children…. Although visiting the MDA camp was a reminder to me of the seeming inexplicable injustice in the world, the question of universal unfairness is one that I encounter almost every day – that is, why do such terrible circumstances happen to such good people? In the wheelchair world, consumers often share with me that they’ll never understand why they received their injury, illness, or disease, that they wrestle with the injustice of it all. And, I never have a direct answer. But, I do have at least one perspective that touches upon the subject of life’s “unfairness” – and the MDA campers hit home the point for me. Of course, we know that there are direct attempts to answer why bad occurrences happen to good people. Religion has its answers that run the gamut, from it’s God’s master plan, to it’s bad karma from a previous life. And, science, too, has its direct answers, from cancer being gene mutations, to paralysis being an injury to the spinal cord. These answers, however, still leave intellectual loopholes, where we can look at examples like Dr. Wayman R. Spence, an original anti-smoking crusader, who himself ultimately died of cancer after 50 years of treating others, and it’s truly impossible to see any justice in such an uncanny circumstance – it’s haunting, really. Still while maybe we will never be able to intellectually answer life’s injustices beyond, Life isn’t fair, we can use coping mechanisms to address them. See, we universally approach life from three perspectives: What is; what can be; and, what should be. And, by understanding the roles that each of the three perspectives play in our own lives, we can better cope with seeming injustices. What is, is truly the givens, the realities of any situation as known in the present. It’s the, my father has cancer, my husband is an adulterer, my daughter is an alcoholic, I have multiple sclerosis. What can be, is what we logically can do to address a situation moving forward. It’s the, my father has cancer, but treatment will extend his life; my husband is an adulterer, but I need to get a divorce and find a loyal guy; my daughter is an alcoholic, but getting her into a rehabilitation program is a wise step; I have multiple sclerosis, but medication and therapy may slow its progression. What should be, is truly wishful thinking, not based in reality, but dwelling in questions of fairness. It’s the, my father shouldn’t have cancer; my husband shouldn’t be a cheater, my daughter shouldn’t be an alcoholic; I shouldn’t have multiple sclerosis. What’s fascinating is that when we look at the three perspectives – what is, what can be, and what should be – only two are relevant, having any impact or meaning in our lives. The third simply leaves us empty, without the ability to do anything, trapped in despair. Can you guess which two are empowering, and which one is debilitating? Of course, what is and what can be are very empowering – that is, we can act upon them. However, dwelling on what should be is truly debilitating because there’s nothing we can do but wish upon a seeming impossible, asking ourselves, Why?, silently screaming, It’s not fair! Nothing good comes out of stewing over what should be. And, that’s what I ultimately took away from my visit to the MDA summer camp. As adults, we’re so caught up in the what should be’s of life – how life is unfair – that we overlook the intrinsic value of what is and what can be. For example, rather than celebrating the current life of our loved ones who have cancer, we dwell upon the unfairness of their pending passing. Rather than moving forward from bad relationships, we stew over how we were wronged. Rather than appreciating our jobs, we focus on any negatives. And, rather than accepting those around us for who they are, we want to change them. That is, we go through life lamenting – often to the point of depression – about how things should be, not recognizing what is or realistically what can be. Yet, the kid’s attitude at the MDA summer camp was just the opposite – it was totally about what is and what can be, and it was contagious. I only saw life, love, and laughter. It was the most positive place on Earth, making Disney World seem glib. It was a true celebration of living in the moment, where no one questioned what should be, but reveled in what is and what could be. Even we adults ended up with our faces painted, coloring with the kids, and eating watermelon! Yes, bad things happen to the best people, the weight of the worst can land on our shoulders – and none of it’s fair, justified, or explainable. Yet, we don’t live in a world of equitable should be’s; rather, we live in a world of what is and what can be. And, let us make the most of those, where our days aren’t filled with longing or self-pity, but are celebrated with appreciation and joy for what’s within our immediate presence: The beauty of what life is and can be.